So I’m up in the Mountains again but this time it’s for work, believe it or not. 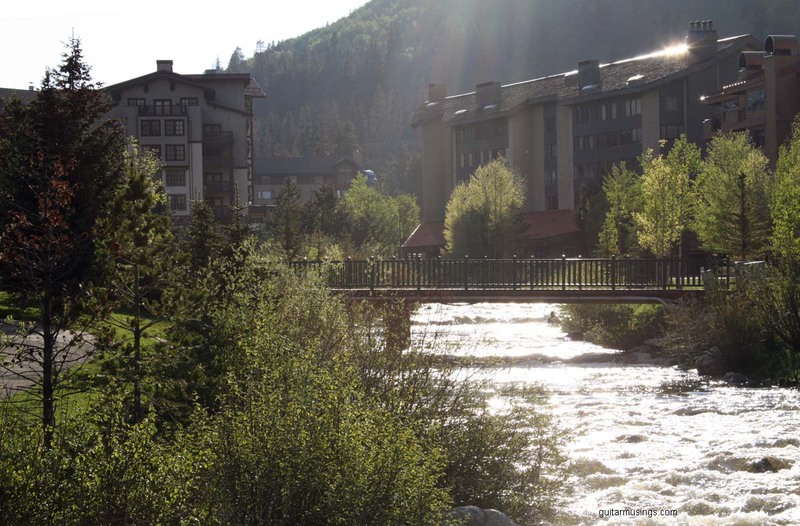 I’m here at the beautiful Copper Mountain resort for the TIE (Technology in Education) conference this week and after 5 years of coming to this conference, I have decided to present as well. My presentation will be on open source Content Management Systems. Sounds gripping doesn’t it? The guy who checked me in, asked about it and soon regretted it. He said that I “lost him at ‘open’.” I just told him it’s how to make a web page with certain types of software. He acted like he was interested and moved on to sending me on my way. I’ll give him credit though for trying. What is nice is that it will be just me and my wife for the whole week because the kids are staying with Grandma and Grandpa. No kids, unless you count my guitars which you could probably make a good argument for. Especially, considering how much I packed for them. Here’s the lowdown. I brought two guitars (Martin, Takamine nylon), music stand, a ton of sheet music, two guitar stands, and other misc things like extra strings, capo, metronome and so on. I gotta make the practice space comfortable. Anyway, I just got done setting up all the stuff and it’s a good thing we aren’t haven’t company because my six string children are taking up quite a bit or room. While I’m up here, I’m hoping to find a guitar store or luthier in the Dillon/Frisco area and check them out. I’ll just have to make sure to leave the CC card in the room so I don’t adopt another child. I laughed out loud over this post. You and your guitar children. This is a riot. See this is what I mean by you are very professional about this. All professionals know where their priorities lie. : ) It really does make you stand out and very unique. For you it probably seems quite normal but for someone who doesn’t have that deep connection with the guitar it is hilarious and very fascinating. My sweetheart, having been a professional performer at one point, would probably totally relate to it. I love it!